“The Eden” is a spectacular par 3 design that hails from the 174 yard 11th (High-Hole-In) at the Old Course at St. Andrews. The Eden along with the Redan are often considered the two best par 3 designs in golf. The Eden is designed to test a player’s mid-iron game. Typically an Eden hole measures between 160-180 yards. In recent years, technological advances have led to some courses lengthening the hole to restore the original intent. The Eden green is well protected and slopes heavily from back to front. Eden holes have distinct, deep bunkering protecting the green complex. This bunkering includes a left bunker called the “Hill”, a pot bunker on the right the “Strath”, the “Eden” bunker behind the green and the “Cockleshell” or “Shelly” bunker short and right of the green. The severe green challenges both accuracy and distance control. Across the surface will have a great deal of break and a miss long of a pin will leave a quick putt. Missing in the wrong spot on this green can lead to embarrassment, such as putting the ball off the green, or worse into the “Strath”, the pot bunker. The place to miss on an Eden hole is short, which leaves an uphill chip or putt. One of the most famous holes in golf, the 11th at St. Andrews has given golfers fits for years. The severe green complex has been the scene of numerous implosion during the Open Championship. America’s first eden hole from C.B. Macdonald’s Chicago Golf Club has all of the characteristics of its predecessor. Notice how the “shelly” bunker in front frames the hole, while the “hill”, “strath” and “eden” bunkers guard the heavily sloped green from wayward shots. Many consider the 13th at NGLA as the best eden hole in the world. The 13th at Macdonald’s gem has all of the core features of it’s St. Andrew’s predecessor but also boasts a pond that adds to its beauty. The par 3 13th at National Golf Links of America. A beautiful example of the eden hole is at this Chicago area Seth Raynor design. Last year, Shoreacres added yardage to the 8th to make the hole play closer to the original intention due to technology advances. Notice the deep “Strath” bunker on the right and extremely sloping back to front green. The last time I played this hole, I hit a tremendous shot that landed pin high, but due to the slope my shot rolled back off the green and into the rough short of the green. This should give you some perspective on how challenging the green is. The 8th hole at Shoreacres, a Seth Raynor design. Another look at Shoreacres 8th from the hill bunker a tough spot to get up and down from. The par 3 8th at Shoreacres, a look at the green. The eden at St. Louis was lengthened to 200+ yards and much like Shoreacres now plays truer to its original intention. The green at St. Louis' 3rd is vicious. The severe slope from back to front and left to right makes finding the right side of the green and staying below the hole a necessity to make par or better. Any miss at the 3rd almost ensures a bogey or worse. St. Louis C.C. Eden hole. 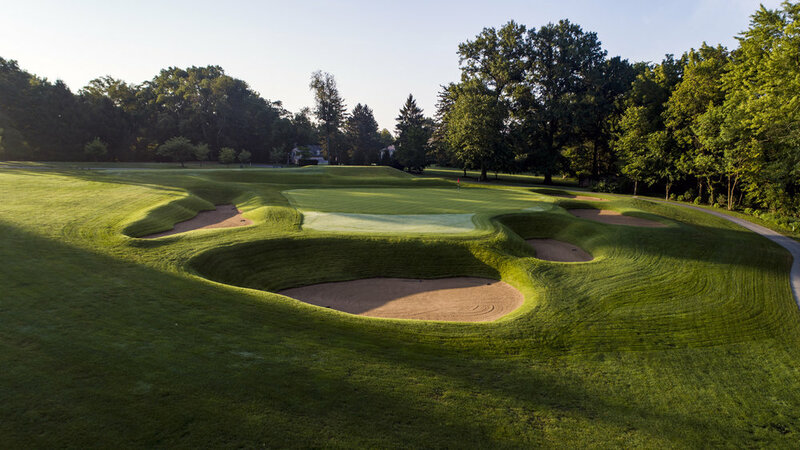 The Seth Raynor design outside of Pittsburgh features the eden early in the round. This version of the eden is heavily bunkered, featuring two “Hill” bunkers and a very deep and large “strath” bunker. Much like Shoreacres and St. Louis C.C., Fox Chapel too has been lengthened to adjust to modern technology. The 3rd at Raynor's Fox Chapel Golf Club. Even on the calmest of days, the 11th at Fishers Island provides a menacing test. The green is severe and a great golf shot to find the surface when it's windy. The bunkers on either side of the green are trecherously deep. The green slopes from right to left which makes the shallower right bunker play deeper. The 2nd hole at Bandon Dunes Golf Resort's Old Macdonald Course. Photo Credit: Bandon Dunes Golf Resort & Timothy Scahill. Tom Doak & Jim Urbina was able to create a brilliant version of the eden at the Old Macdonald Course. This photo does a great job at showing the severe back to front slope of the green and the treacherous front right “strath” pot bunker. Here is a closer look at the “Strath” bunker at Old Macdonald. The strath bunker at Old Macdonald. Photo Credit: Bandon Dunes Golf Resort & Timothy Scahill. Here is a shot of the Eden hole from The Creek Club, a Macdonald design on Long Island. This one has a very similar look to Camargo’s with all of the defining bunkers (“hill”, “strath”, “eden”, and “shelly”). The 15th at Yale follows a wild stretch of golf from 7-14 and sits on some of the site’s flatest land. The green has a severe pitch from right to left and back to front. It makes finding an uphill putt to the hole difficult and forces players to take on the risk of the front right bunkers. The bunkering at this Macdonald - Raynor design are in need of a rework that recaptures the original depth and aesthetic. In front of the Eden 15th at the Yale Course. Here’s a shot from high above the 7th hole at Midland Hills Country Club, a 1919 Seth Raynor design in Minneapolis, Mn. This aerial vantage point gives a great look at the bunkering of the eden hole. The green is framed by a the “hill”, “strath” and “eden” bunkers but doesn’t have a “shelly”. Have a cool eden hole that we should feature? Drop us a line here. Check out more of our template hole profiles here.